Buckeye Bullet Team Blog: Summer Update: New Matlab/Simulink Licenses, Article in the "RealTimes"
Summer Update: New Matlab/Simulink Licenses, Article in the "RealTimes"
The team would like to thank Mathworks for their recent donation of new Matlab & Simulink licenses, as well as their continued support of the program. If you aren't familiar with Matlab and Simulink, it is a technical computing suite that the team uses for almost every aspect of vehicle design and testing. This includes: vehicle simulation, data analysis, and control of the vehicles various electrical systems. For more info check out their website at www.mathworks.com. 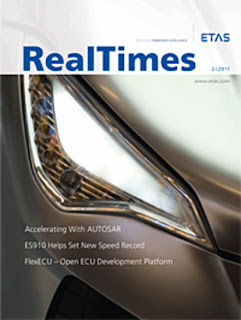 On a related note, an article was recently published in the ETAS RealTimes magazine on the development of the Buckeye Bullet's control system. The article includes how the team uses Matlab and Simulink to interface with ETAS' INTECRIO software and rapid prototyping hardware (the ES910). It can be found under the editors choice section on the ETAS website: "Lightning Fast - ES910 helps set a new land speed record". MORE POSTS and PICTURES! The Countdown was...one post. More more more. It only takes a minute a day.